I have just received urgent reports that on 27th October, at least 9 West Papuan people were shot and 1 was killed as the Indonesian police opened fire in Manokwari. 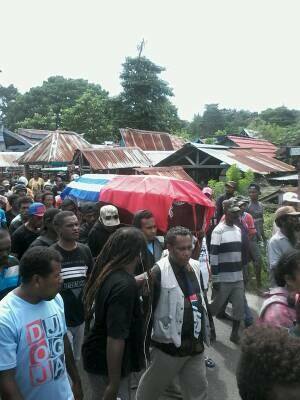 According to reports, West Papuan people took to the streets to protest the murder of a West Papuan youth Vigal Pauspaus (20) who was stabbed by an Indonesian migrant. In response, the Indonesian police opened fire on the crowd and killed West Papuan Independence activist Onesimus Rumayom (56). They also reportedly attacked and shot at least 8 other people including children. My heart is crying tears. How long will my people continue to die and continue t cry for help while the world silently watches? My people are in danger under the the hands of the Indonesia government, military and the police. The Indonesian government is actively seeking for more violence in occupied West Papua in order to excuse killing more West Papuans until they have wiped out the entire population. Recently I made a statement condemning President Jokowi’s empty visit to West Papua while human rights atrocities continue in West Papua. Just a few days later, at least 9 West Papuan people have reportedly been shot by the Indonesian police. There have been so many West Papuan people shot, tortured, raped, lynched, burned alive and killed in other horrific ways and the Indonesian government, military and police responsible are never brought to justice. This is why my people desperately need the world not not only watch what is going on in West Papua but to please act now before it is too late and there are no more West Papuan people left. Over 500,000 West Papuan people have been killed in this neglected genocide. How many more people need to be killed? I want to give a strong message to the world that my people are in danger. If this genocide continues unabated then within the next few decades there will be no more West Papuan people left. The only way in which such atrocities will stop is when we the people of West Papua are free to determine our own destiny in an Internationally Supervised Vote. We have the fundamental right to self-determination and it is vital for our very existence as a people that we will finally be allowed to choose to live in our own free and Independent country. Please hear West Papua’s cry for help against this neglected genocide and illegal occupation.